SAN SALVADOR, El Salvador (CNS) — In San Salvador’s traffic jams or at work, people turn on Radio YSAX to listen to Blessed Oscar Romero’s homilies, just as they did over 30 years ago. 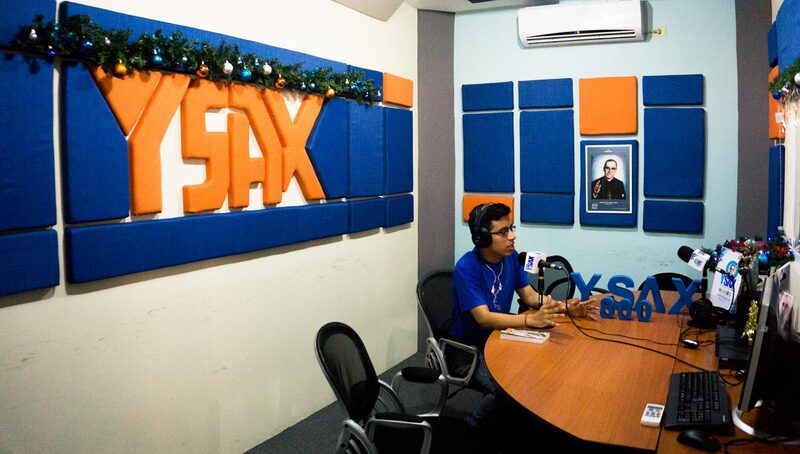 From the 1970s until his assassination in March 1980, Blessed Romero used the radio station YSAX to inform Salvadorans and the international community of the horrors of El Salvador’s civil war. In a time when public media was self-censoring, Radio YSAX served as a spiritual guide as well as a news broadcast. “Oscar Romero collected notes from his listeners and then disclosed when and where human rights were being violated,” Father Edwin Henriquez, director of the radio, told Catholic News Service. Reopened in 2015, the station has set itself one purpose: to keep Blessed Romero alive. Every weekday, at 1 p.m., the late archbishop’s voice reverberates again through the speakers and draws radio listeners from all over the world. When the radio is cut for a few days, people from as far as Europe and Australia call to know what happened. “This radio station gives us hope,” Larin said. “Romero represents a father’s love to us, but he was also a father who defended us, because he denounced the abuse of power.” Larin said Blessed Romero helped his followers reconnect with a concrete, nearby God. In developing countries, the radio as a means of communication remains influential. With only 20 percent of the country’s households having internet access and more than 10 percent of the population being illiterate, the radio has a broad outreach in El Salvador. It answers the need for real-time information and reliable, interactive hosts. For Estephanie Castillo, volunteer at YSAX, the radio is also a relevant tool to evangelize and raise awareness on everyday issues. “Through the radio, we can transmit fundamental values to build a caring and just society,” she said. Radio YSAX speaks to people of all ages. Hearing Blessed Romero’s voice reassures older generations, who recognize him and identify with the historical context of his speech. Most radio volunteers are millennials. For the listeners, Blessed Romero’s message of faith and social justice is still valid in 2017. Yesterday’s state-enforced violence and guerrillas became today’s gang barbarism. As Father Henriquez recalled, Blessed Romero did not give in to political correctness when condemning such abuses. And El Salvador is in dire need of social change. Still hurt and polarized by the civil war that took place in the 1980s, the country suffers from the rocketing unemployment rates and the highest homicide rate in the world. Gang members extort, rob and kill civilians. “The violence we have known during the war has been transformed, the culture of death is still prevalent and our youth is suffering the most,” Father Henriquez said. In this postwar context, Blessed Romero remains a beacon of hope. “In my own personal hardship, I feel like he accompanies me and helps me,” Castillo said.